Miss Isle too is a Mini 6.50. The Mini 6.50 is very short for its intended use and is beamy being nearly half as wide as it is long. Its width carries to the stern, allowing the craft to plane as a fast motorboat does. Minis typically sail as fast, potentially reaching 25 knots. They have two connected rudders and a narrow steel or iron fin keel with a lead bulb at the end. The mast height is typically twice the Mini’s length. 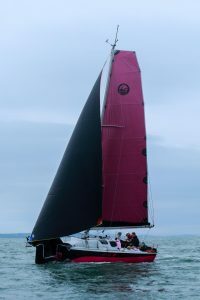 Miss Isle too, as well as helm control, has sail trim operated by 2 Harken electronic winches that are operated by a tiny tongue switch inside the helmet. In 2017 we added a new Code Zero spinnaker. A versatile furling masthead, code zero can be used in a range of wind conditions to improve the boats performance; it can be sailed upwind in light winds but is also effective when reaching and sailing downwind in breezier conditions. The sip and puff control system was designed and built by Gary Lambert in 2012 using cutting edge technology. The system has proved to be extremely robust and has taken MissIsle Too and Natasha around much of the coast of the British Isles. It is hoped that the system can now be commercially manufactured and used in any sailing vessel that requires it. Many new adaptions have been applied to the system as the prototype has progressed, perhaps one of the most notable is the addition of the semi-auto sheeting. This allows the onboard computers to activate the sheet winches when Natasha alters course greater than 15 degrees. This is a particularly useful feature as it ensures that the sails are always fully powered. Something that would not otherwise be possible owing to Natasha only having a single straw that either operates the helm or the sheets.